What Is a Load Balancing Server? | Parallels explains! A load balancing server is an appliance (hardware or virtual machine) or software application that’s usually deployed between clients and a server farm or cluster. Its main function is to detect available nodes in the server farm, receive traffic coming in from clients, and distribute the traffic to those available nodes. The manner by which traffic is distributed will depend on the method—or load balancing algorithm—implemented by the load balancing server. 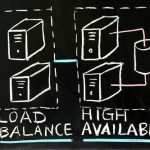 There are several load balancing algorithms, but some of the most common are round robin, least connection, and random. What Is the Purpose of Load Balancing? The purpose of a load balancer is to prevent servers from getting overloaded. If you deploy a single server against a growing number of clients, that server can eventually get overloaded. One way to prevent that from happening is to add more servers. However, simply adding more servers is only half the solution. Who’s to say which server the bulk (or perhaps even all) of incoming will be directed to? If it’s going to be directed to just one server (or just a few servers in the farm), then that server could still get inundated. You can improve this setup by placing a load balancer in front of the server farm so it can direct traffic and distribute it efficiently. Why Is a Load Balancing Server Important to Businesses and Organizations? When an organization offers services to its customers and other end users, it has to ensure high availability of those services, often on a 24/7 basis. For example, if a company is offering virtual application delivery via Remote Desktop Session Host (RDSH) to remote desktop (RD) clients, it has to ensure that each client can always connect to a healthy RDSH server. This can be done through a load balancing server—which, traditionally, would be a third-party solution that had to be installed, configured, and deployed separately. When it comes to RDSH and VDI load balancing, Parallels® Remote Application Server (RAS) makes it easy. Parallels RAS comes with load balancing capabilities out of the box. It monitors each host in the server farm for CPU usage, memory usage, and number of concurrent sessions, and then redirects incoming connections to the host with the least load. Try the 30-day evaluation period of Parallels RAS to experience quick and easy load balancing yourself. Nginx | What is load balancing? ServerFault | What kind of load balancing algorithms are there?